Lavish parade to mark Tibet's 50th year Jump to media player China has marked 50 years since it established Tibet as what it calls an "autonomous region", by holding a large parade in Lhasa. Ancient Tibetan town destroyed by fire Jump to media player An ancient town in Tibet has been destroyed by a fire that raged for 10 hours on Saturday. Buddhists crawl to Tibet holy city Jump to media player Four Buddhists are crawling on their hands and knees to the holy city of Lhasa for an annual pilgrimage as a way of showing their humility in front of Buddha. Would the Dalai Lama return to Tibet? Jump to media player The Dalai Lama talks to BBC's Andrew Marr about Tibetans who have self-immolated in protest over Chinese rule. He also spoke about whether, after 50 years in exile, he would ever return to Tibet. China has marked 50 years since it established Tibet as what it calls an "autonomous region", by holding a large parade in the capital Lhasa. 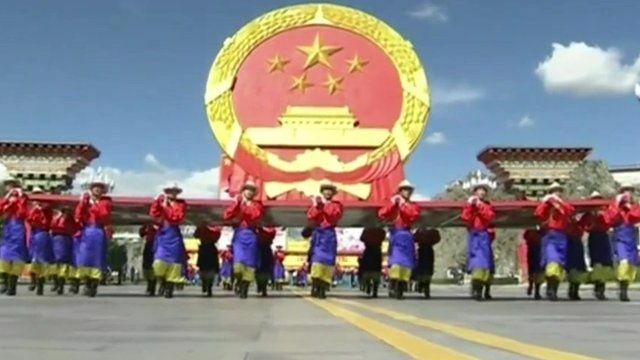 The event, which featured large colourful floats and military marches, was attended by senior Communist Party officials. Foreign news organisations like the BBC were not allowed to travel to Tibet to cover the event. John Sudworth reports from Beijing.